My crusade against the border-adjustable tax (BAT) continues. In a column co-authored with Veronique de Rugy of Mercatus, I explain in today’s Wall Street Journal why Republicans should drop this prospective source of new tax revenue. …this should be an opportune time for major tax cuts to boost American growth and competitiveness. But much of the reform energy is being dissipated in a counterproductive fight over the “border adjustment” tax proposed by House Republicans. …Republican tax plans normally receive overwhelming support from the business community. But the border-adjustment tax has created deep divisions. Proponents claim border adjustability is not protectionist because it would automatically push up the value of the dollar, neutralizing the effect on trade. Importers don’t have much faith in this theory and oppose the GOP plan. 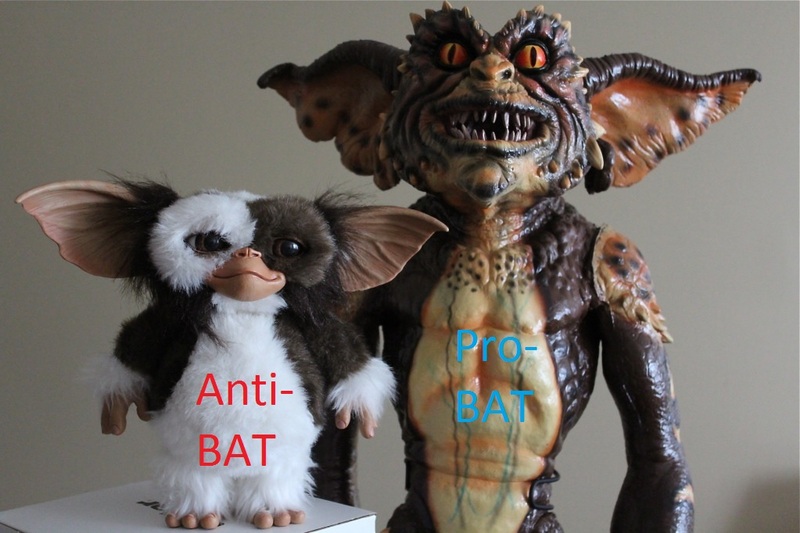 Much of the column is designed to debunk the absurd notion that a BAT is needed to offset some mythical advantage that other nations supposedly enjoy because of their value-added taxes. Proponents of the border-adjustment tax also are using a dodgy sales pitch, saying that their plan will get rid of a “Made in America Tax.” The claim is that VATs give foreign companies an advantage. Say a German company exports a product to the U.S. It doesn’t pay the American corporate income tax, and it receives a rebate on its German VAT payments. But an American company exporting to Germany has to pay both—it’s subject to the U.S. corporate income tax and then pays the German VAT on the product when it is sold. Sounds persuasive, at least until you look at both sides of the equation. When the German company sells to customers in the U.S., it is subject to the German corporate income tax. The competing American firm selling domestically pays the U.S. corporate income tax. Neither is hit with a VAT. In other words, a level playing field. Here’s a visual depiction of how the current system works. 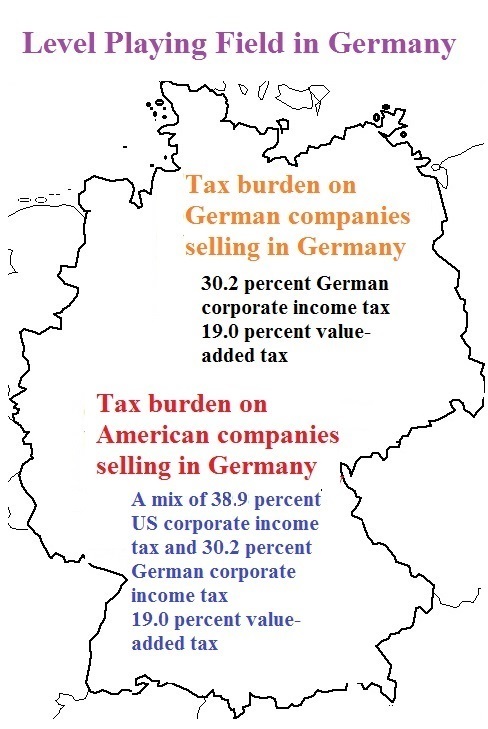 I include the possibility that that German products sold in America may also get hit by the US corporate income tax (if the German company have a US subsidiary, for instance). What’s most important, though, is that neither American-produced goods and services nor German-produced goods and services are hit by a VAT. Now let’s consider the flip side. What if an American company sells to a customer in Germany? The U.S. government imposes the corporate income tax and the German government imposes a VAT. But guess what? The German competitor selling domestically is hit by the German corporate income tax and the German VAT. That’s another level playing field. This explains why economists, on the right and left, repeatedly have debunked the idea that countries use VATs to boost their exports. Here’s the German version of the map. Once again, I note that it’s possible – depending on the structure of the US company – for American products to get hit by the German corporate income tax. 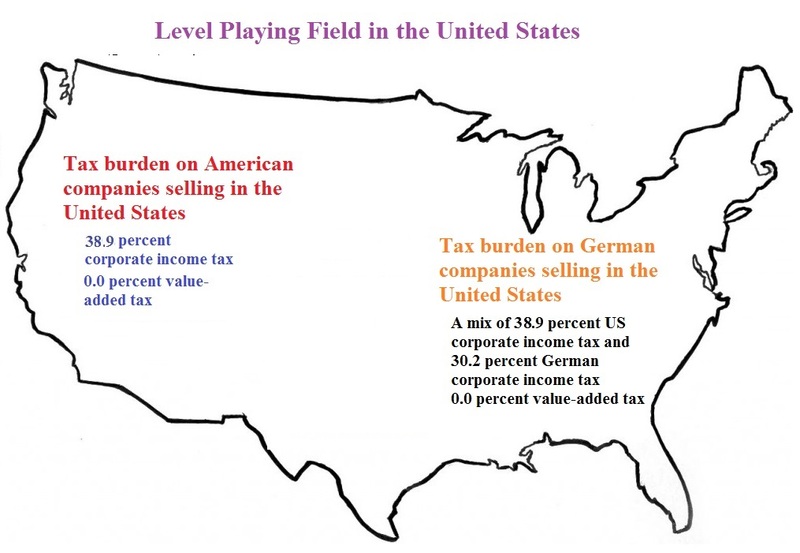 But the key point of the map is to show that American-produced goods and services and German-produced goods and services are subject to the VAT. By the way, it’s entirely possible that an American company in Germany or a German company in America may pay higher or lower taxes depending on whether there are special penalties or preferences. Those companies may also pay more or less depending on the cleverness of their tax lawyers and tax accountants. But one thing can be said with total certainty: The absence of an American VAT does not result in a “Made-in-America” tax on American companies. Even Paul Krugman agrees that VATs don’t distort trade. Moreover, Veronique and I point out that the lack of a VAT creates a big advantage for the United States. One big plus for Americans is that Washington does not impose a VAT, which would enable government to grow. This is a major reason that the U.S. economy is more vibrant than Europe’s. In Germany, the VAT raises so much tax revenue that the government consumes 44% of gross domestic product—compared with 38% in America. And to the extent that there is a disadvantage, it’s not because of some sneaky maneuver by foreign governments. It’s because of a self-inflicted wound. America’s top corporate income tax of 35% is the highest in the developed world. If state corporate income taxes are added, the figure hits nearly 40%, according to the Congressional Budget Office. That compares very unfavorably with other nations. Europe’s average top corporate rate is less than 19%, and the global average is less than 23%… That’s the real “Made in America Tax,” and it’s our own fault. The column does acknowledge that BAT supporters have their hearts in the right place. They are proposing that new source of revenue to help finance a lower corporate tax rate, as well as expensing. But there’s a much better way to enable those pro-growth reforms. If Congress simply limits the growth of outlays to about 2% a year, that would create enough fiscal space to balance the budget over 10 years and adopt a $3 trillion tax cut. If Republicans want a win-win, dropping the border-adjustment tax is the way to get one. And what if Republicans aren’t willing to restrain spending? Then maybe the sensible approach is to simply cut the corporate tax rate and declare victory. I’ve addressed that topic a couple of times. Left-leaning advocates like “destination-based” tax systems such as the DBCFT because such systems undermine tax competition and give politicians more ability to increase tax rates. The “border adjustability” in the plan is contrary to the rules of the World Trade Organization (WTO) and there’s a significant risk that politicians might try to “fix” the plan by turning it into a value-added tax. In theory, the import tax in the DBCFT is not necessarily protectionist, but the machinations of to justify that assertion, combined with the conflict it creates in the business community, undermine the consensus for reform. I had a chance to speak about the DBCFT to a gathering put on by the Washington International Trade Association. I hit on all my main reasons for being worried about the border adjustable provisions. For those who want additional information, I was preceded on the panel by Gordon Gray of the American Action Forum and followed by John Veroneau of Covington and Burling (and formerly with the Office of U.S. Trade Representative). You can watch the entire event by clicking here. 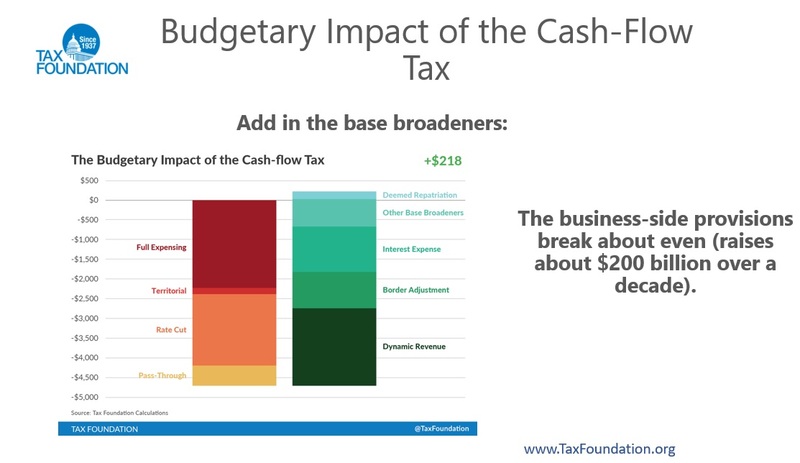 Regarding my remarks, I think the most relevant thing I said was when I shared new data from the Congressional Budget Office and pointed out that we can simultaneously balance the budget within 10 years and have a $3 trillion tax cut if politicians simply exercise a modest bit of spending restraint and limit annual budget increases to 1.96 per year. And the most important thing that I said was when I warned that proponents of good policy should never do anything that might create the conditions for a value-added tax in the United States. Some people say the most important rule to remember is to never feed gremlins after midnight, but I think it’s even more important not to give politicians a new source of revenue. Unless, of course, you want bigger government and more red ink.